Eyelash extensions are the latest trend in the beauty industry! These Semi-permanent extensions give your lashes a natural look with added length and thickness. Eyelash extensions are made to mimic the natural curve of your lashes and are applied to each lash. Due to the natural lash cycle and shedding, every 60 to 120 days a new lash grows in. Because of this, we recommend coming in every 2 to 3 weeks for touch ups on the new growth. Your natural lash cycle and how you take care of your lashes will determine how long they last. 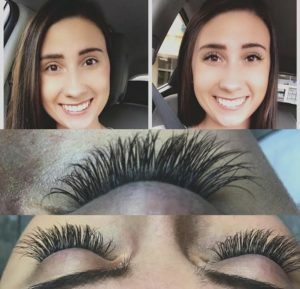 An alternative to lash extensions! Lash lifting takes your own natural lashes and perms them to a beautiful natural curl. We then finish off with tinting your lashes for added depth and drama. Results last 4 to 8 weeks depending on your natural lash cycle and how you take care of them.